Card: 9 Queen of Laughter from The Heart of Faerie Oracle cards by Brian and Wendy Froud. Message from The Faeries: Its been quite some time since we brought your attention to the Queen of Laughter, and we think the reminder of her existence is long over due. Have found yourself losing your keys a lot these days? You could have sworn that you left that book on the table. Where on earth did you put that necklace? Those brief moments of confusion and frustration and to remind you to stop, take a breath, relax and not take yourself too seriously. It’s true, sometimes we can be a little mischievous. We have hid some of your things over the years. We do find it really funny to watch you look around for your keys when you just know you had them in your pocket. We usually only do this to you when you’ve been taking yourself way too seriously and when you have forgotten to laugh or smile. We do this when you are very stuck. When you do find your keys a couple of minutes later in that place where you just knew you put them, you have a moment of confusion and then you smile. Your feeling of frustration turns to feelings of gratitude and joy. When you relax, let go, have fun and laugh, you allow love to flow through your life. When you are holding on too tightly to unhealthy situations in your life, and you are unable to relax and let go, we assist you with gentle reminders that things aren’t so bad. We try to bring a smile to your face in whichever way we can. Hiding your objects is usually a last resort for us. We try all kinds of things before it gets to that point. If you aren’t paying attention and you are so blinded by your pain and suffering, we have to take more extreme measures. Quite often sending a bird to land on your windowsill is enough to make you smile or even laugh. If a simple thing like this can’t bring a smile to your face, then we feel it’s our duty to do whatever it takes to make you smile. So, instead of us taking some extreme measures to bring laughter into your life, do yourself favour and smile a little more. Do things that make you smile and laugh. Bring joy and love into your heart. This joy and laughter will spread to those around you. Laughter is some of the most powerful magic in the Universe. Be the magical person that you are and shine brightly for yourself and the people who surround you. Watch it work wonders. We know it does. We live and breath this magic. Our very life depends on it, and so does yours. 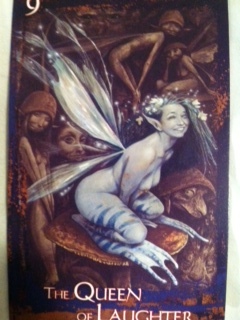 This entry was posted in Faerie Reading and tagged Faeries, fairy, happiness, laughter, Oracle, Tarot by faeriemessenger. Bookmark the permalink.